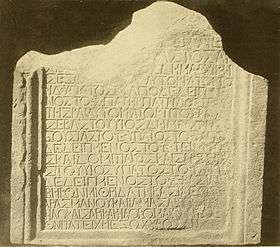 The Armazi stele of Vespasian (Georgian: ვესპასიანეს არმაზის სტელა) is a stele with Ancient Greek inscriptions found in 1867 at Armazi, near Mtskheta, in the ancient capital of the Kingdom of Iberia. The stele memorialises reinforcement of fortification of Armazi walls by Emperor Vespasian. Additionally, the inscription mentions two emperors Titus, Domitian and two kings Mihrdat I of Iberia, Pharasmanes I of Iberia and prince royal Amazaspus. The inscription is dated 75 AD. The top of the stele is lost. According to Professor David Braund the missing text was in Latin or Armazic (outgrowth of Aramaic language). Cyril Toumanoff identifies Amazaspus as King Amazasp I of Iberia, though it can be prince royal Amazaspus, son of Pharasmanes I of Iberia, who is known from the Epigram of Amazaspos found in Rome.